With the Fiat 500 set to come Stateside under the Italian automaker's partnership with Chrysler, our interest already is piqued by any opportunity to further enhance the retro mini's performance. Echoing founder Karl Abarth's Germanic roots, German tuning house Karl Schnorr has answered the call with a two-stage performance upgrade catalog to give the scorpion some added sting. Fiat itself already offers the 500 in several states of tune. Above the standard engines, the company's Abarth in-house tuning arm offers the 133 horsepower 500 Abarth and the 158-hp 500 Abarth EsseEsse. Schnorr takes things two steps further with the 185-hp, 950-euro (around $1,350) Stage 1 kit and the 197-hp, 5,050-euro (nearly $7,250) Stage 2, complete with upgraded turbocharger and custom sports exhaust. Fresh coilover shocks drop the ride height by a few millimeters, mounted to 17-inch OZ alloys and complemented by even more stripes than the scorpion brand offers from the factory. Check it out in the gallery below and in the press release after the jump. 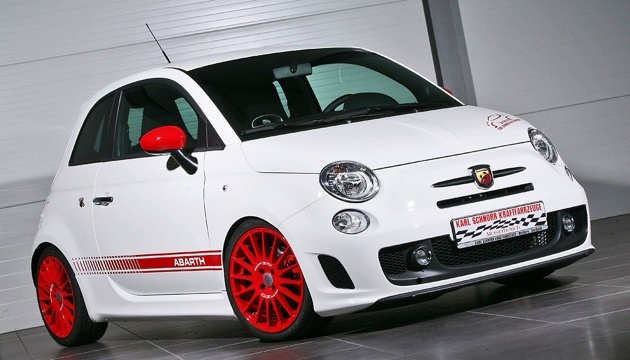 Karl Schnorr upgrades the Fiat 500 Abarth originally appeared on Autoblog on Tue, 25 Aug 2009 16:58:00 EST. Please see our terms for use of feeds. 0 37,000+ Dodge Ram pickups recalled over... faulty HVAC software? !